It’s difficult to find a company with a focused dedication to rain gutter and roofing services. At Affordable Gutters Plus LLC, we’ve made it our business to become the only company you’ll need for rain gutter installation and repair. As experts in roofing services, we also pay attention to all the small details. From large-scale projects such as metal roofs, to the installation of complementary products such as squirrel deterrent flashing and leaf guards, we’re the company in north Georgia that you can trust. If you live in Canton and Roswell, GA or the surrounding area, give us call at 770-735-4433. We pride ourselves on our stature as an expert-level provider of rain gutter installation and roof services. If you’ve got rusted, leaky gutters or problems with your roof drainage, we’re the company to call. The same goes for rotted fascia or other roof problems: trust the experts at Affordable Gutters Plus. If you have problems with your gutters, or if you fear that your roof is vulnerable to the elements, we’ve got you covered. You work hard to keep a roof over your head. At Affordable Gutters Plus, we work hard to keep the roof in tip-top shape. The damage from leaky gutters or faulty roof drainage can quickly become dramatic. 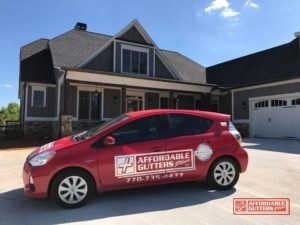 If you live in Canton and Roswell, GA or the surrounding area, don’t hesitate if you have a problem: call us today at 770-735-4433. Updated on September 25, 2018 at 8:53 pm by Affordable Gutters Plus LLC.